The Bellagio gardens at the holidays are photographed thousands, maybe millions of times — great PR for the Bellagio and Las Vegas. Huge holiday arrangements like this one decorate the Bellagio’s check-in area just outside the holiday gardens. 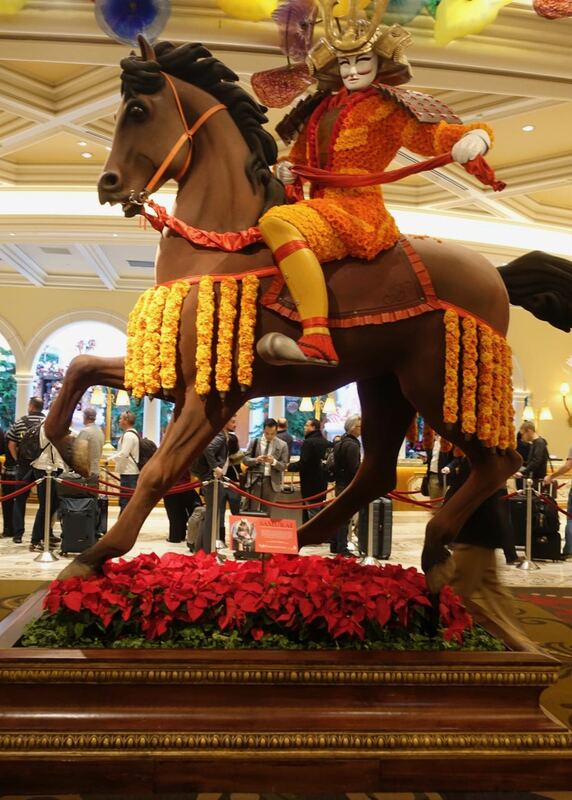 Also in the check-in lobby area just outside the holiday gardens is a samurai statue reminding visitors of the lifestyle and art of the samurai warrior currently on display at the Bellagio Gallery of Fine Art. 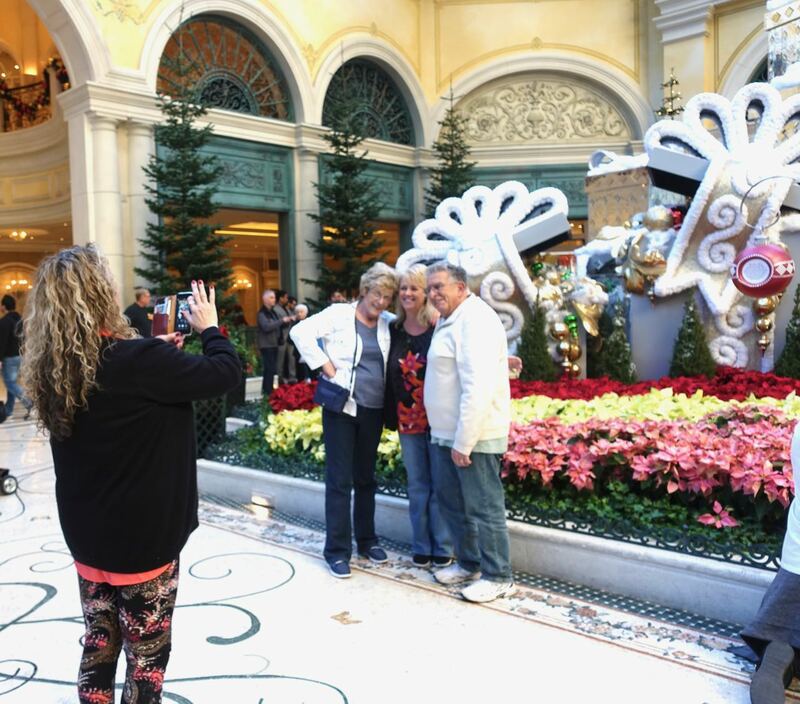 The public is welcomed free to the Bellagio gardens 24 hours a day through January 6. The largest presence in the gardens is a 42-foot White Fir decorated with 7,000 lights and 2,500 ornaments. 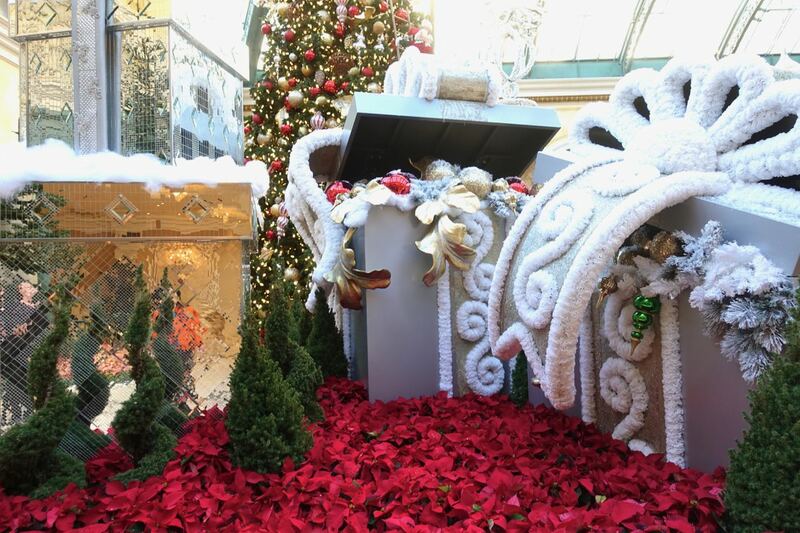 A trio of silver wrapped boxes await placement under the tree. 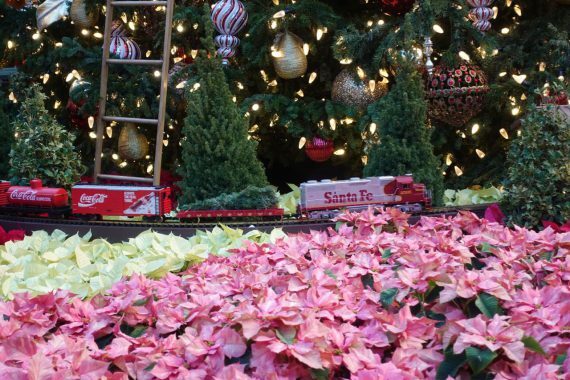 New to the display this year is an 18-foot ice queen, dressed in preserved red roses, silver palmetto leaves, fresh hydrangeas and phalaenopsis orchids. 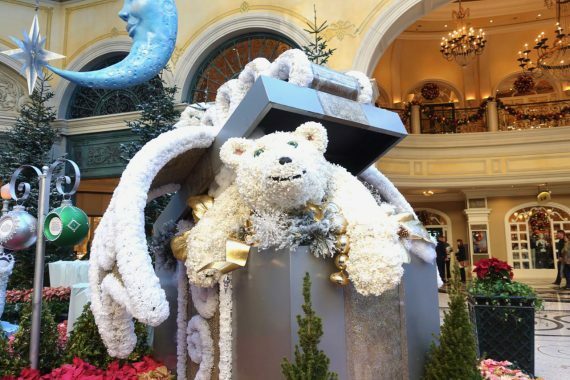 A polar bear as a gift? Well at least he is cute. 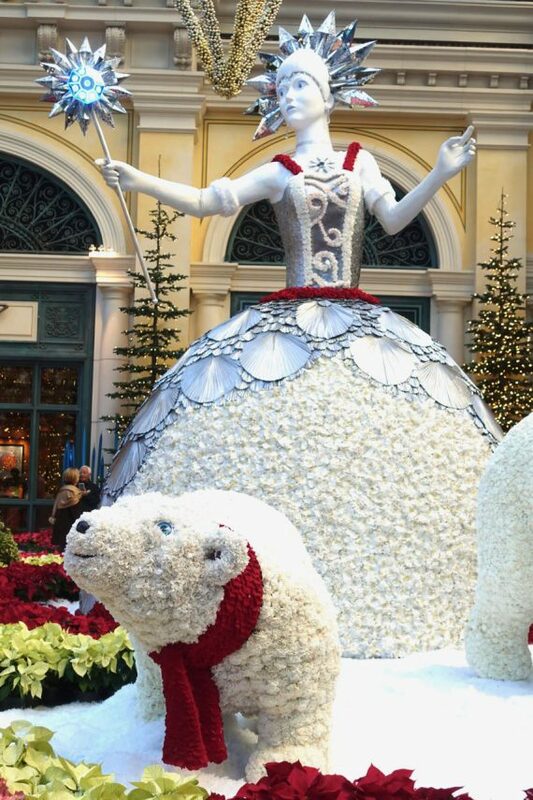 The bears in the gardens are decorated with white carnations and hydrangeas. One of three trains that give a running video of their their routes is seen here. Note the Coca Cola mention. A sponsorship, perhaps? 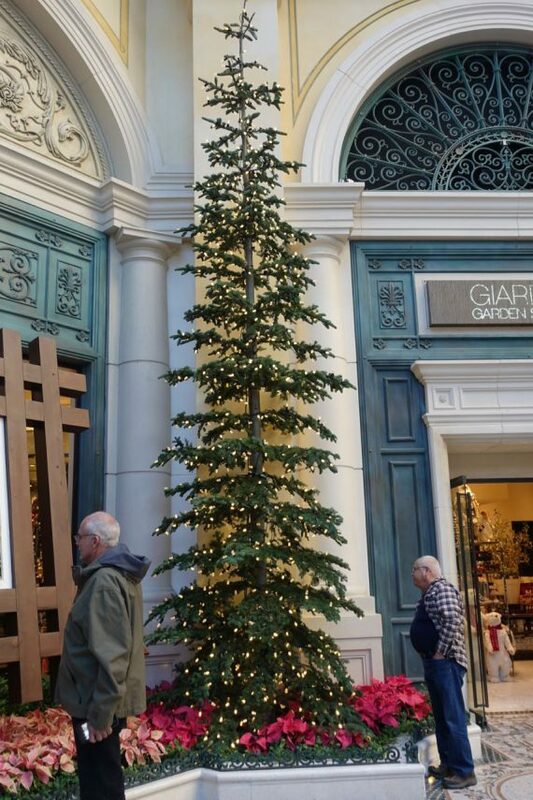 Just a fir tree with lights — no ornaments necessary. 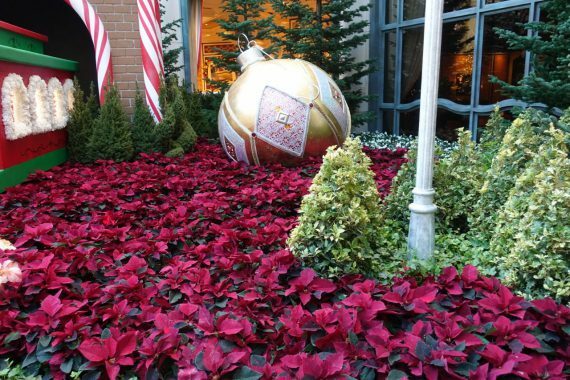 Ornaments come in all sizes and poinsettias in all colors at the Bellagio display. 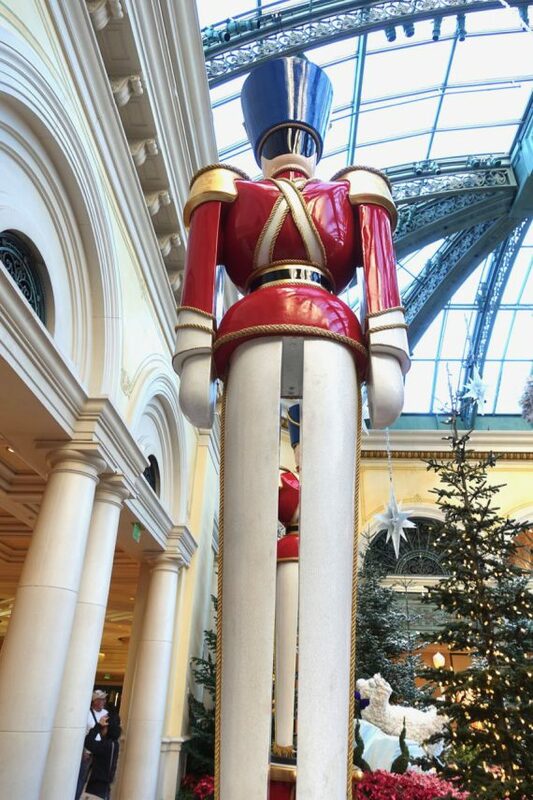 He’s mighty tall and he guards the premises. 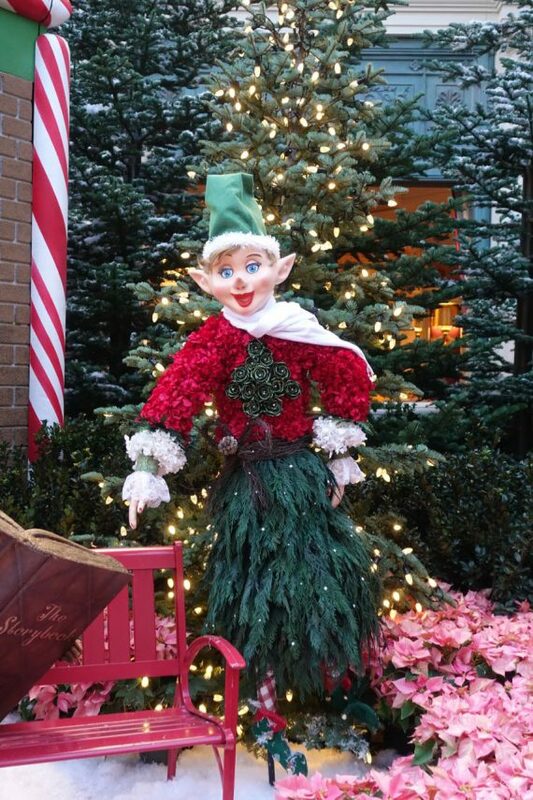 My my, little man, what a colorful holiday wardrobe you have. The Bellagio tells us Designer Ed Libby and the Bellagio Horticulture team drew inspiration from classic children’s books and holiday lore, including “the Chronicles of Narnia” by C.S. Lewis. 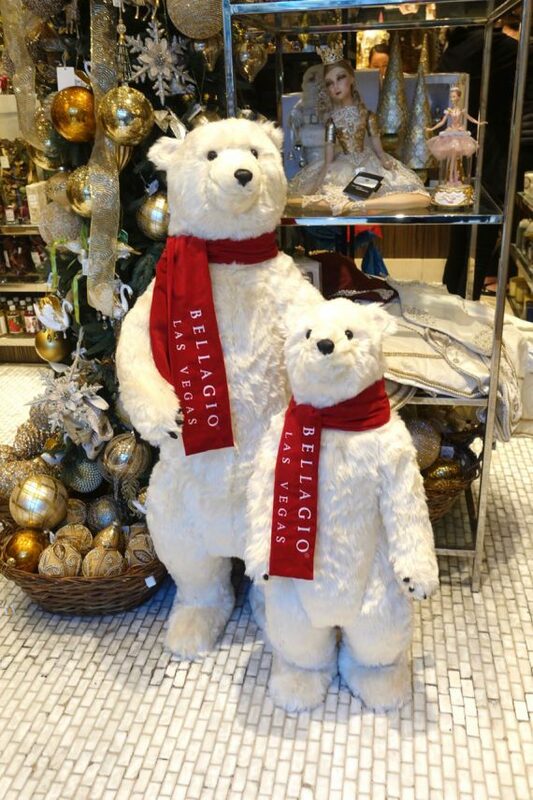 Though not decorated with flowers, these bears are on sale at a shop whose entrance is at the rear of the Bellagio gardens. 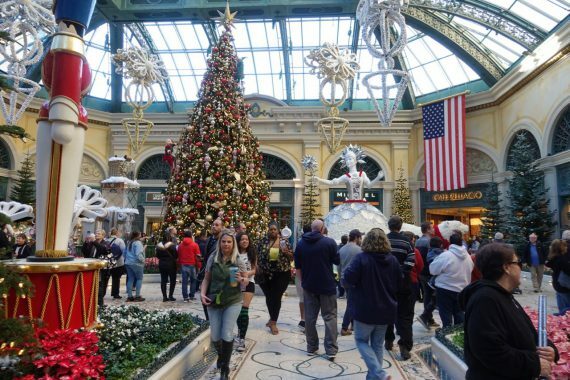 The shop gives visitors plenty to see and dream about. I saw one somewhat intricate glass ornament on a tree of ornaments that alone cost $63.00. 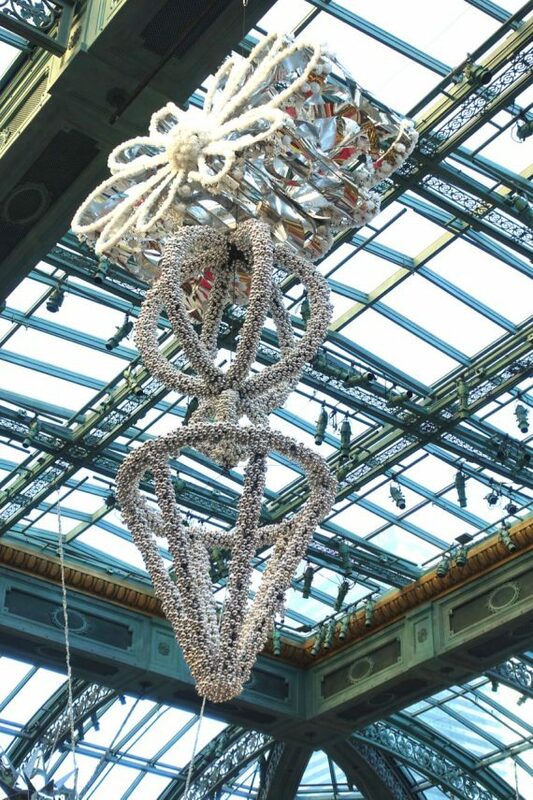 Folks who look “up” at the Bellagio gardens see snowflakes and these massive hanging ornaments. 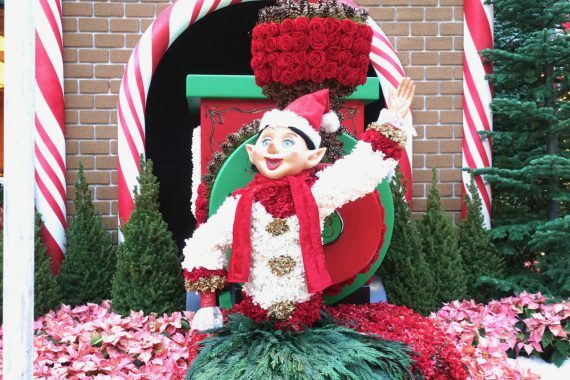 An elf who likes to wave hello and goodbye to guests. Happy holidays, everyone! 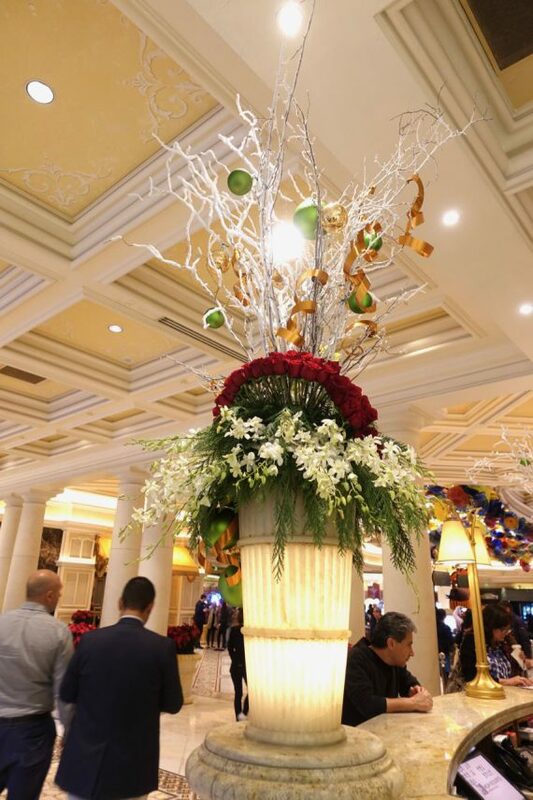 It is always an amazing and beautiful display, thanks for all the interesting info!